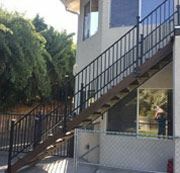 Fast-Stairs are modular adjustable steel stair stringers; simply screw step/treads and railings (not included) to the engineered steel stair stringers to build solid, square & plumb, free-standing indoor or outdoor stairs. Designed for fail-safe stair building for all, our 32 models can frame 2 ½ to 13 ft high stairs and more. 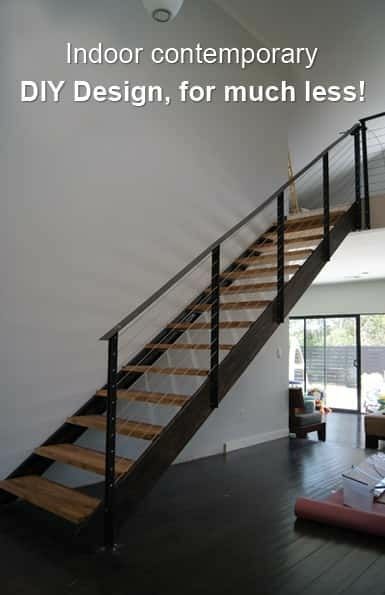 With the perforated steel stringers you can fasten any stair finish materials you can find locally. Contrary to wood, dimensionally stable steel stringers won’t warp, crack, split, rot or shrink. No stair stringer calculator required. 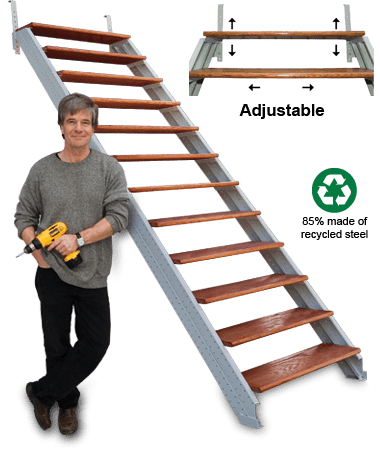 All starter (4 steps & 10 steps) packages contain left and right 16 gauge, double C channel, top and bottom welded recycled steel stair stringer sections with middle slide connectors, 11″ height adjustable ¼” steel top hook straps (all powder-coated) and all zinc-plated connecting fasteners. Two-step extensions are also included in many of our Fast-Stairs kits (Ex: An A6 kit includes an A4 and a A2; a B14 kit includes a B10 and two B2s, see assembly tutorial video for details). 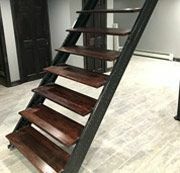 Nothing fancy; just basic, function-designed, versatile, dependable products which enable you to quickly assemble your stairs with the stair parts you choose, from 2x’s to the best hardwood and other fine stair finish products (none included) you’ll find locally and economically. All Fast-Stairs stringers measure 6 ½ x 1 ¼ inches (not including the welded/pre-holed welded inside step supports which your step/treads will cover). Fast-Stairs allow you to later customize, even move your stairs. New smaller models now allow you to build minimum 4 step stair sections to and from any intermediate landing (which you’ll frame). 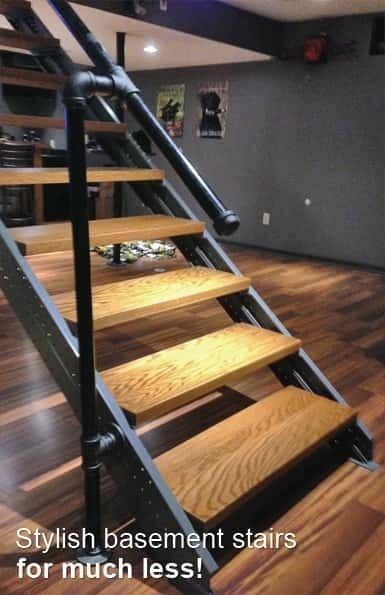 Fast-Stairs are both permanent and re-usable and easy to customize. 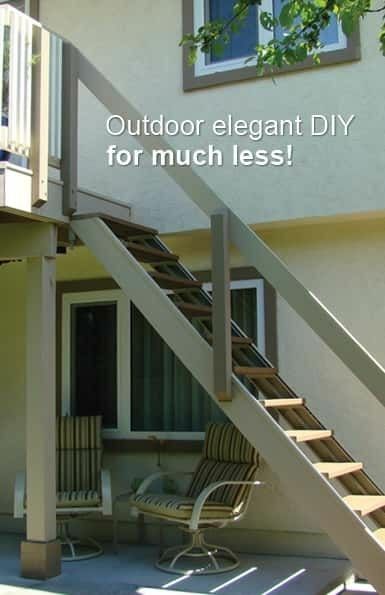 Fast-Stairs offer do-it-yourself stair solutions for consumers, remodelers, builders and contractors alike. 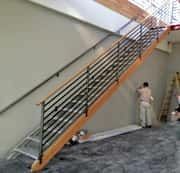 There is no easier, faster or better way to build super strong and economical stairs. 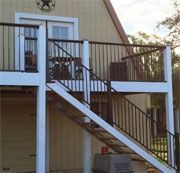 The safe, rustproof powder-coated stringers set up and adjust easily for all stairs including basements, attics, lofts, condos, post-frames, storage, garages, warehouses, barns, cabins and outdoor uses including roofs, decks, landscape & construction job sites. Simply measure the floor to floor (not floor to ceiling) vertical height of your stair project and then choose from the 32 Models & Prices See our stair stringer selection chart the Fast-Stairs adjustable model that matches the desired height of your stairs. Make sure you have the necessary bottom floor horizontal run and that your top floor opening is large enough (75% of your horizontal run) for an 80″ head clearance. 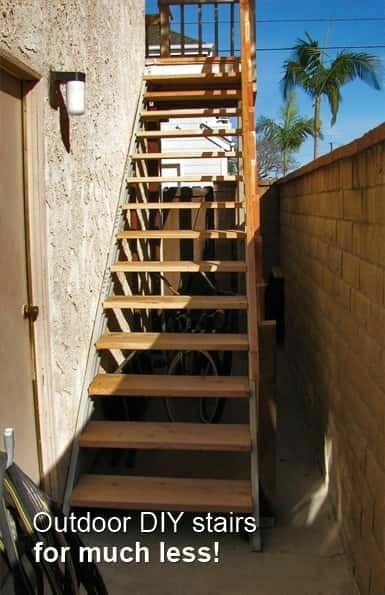 Years of experience in this field have shown us that many customers are looking for the option of having slightly steeper stairs in all kinds of applications, residential or not, in and outdoors, or simply where tight space is an issue (an extra ½ inch on your risers’ height will save you about 4 feet in bottom horizontal run on 13+ step stairs). Only we offer this option with ready-made, prefab products. 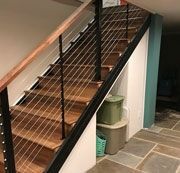 Designed for fail-safe stair building, Fast-Stairs are adjustable steel stair stringers on which you add the steps and finishing materials of your choice. 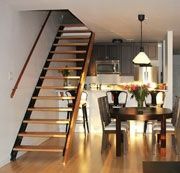 Height: The top step/tread in any staircase can be level with the top floor/level, as long as it is as wide as the top floor/level opening. 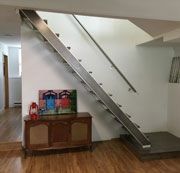 All Fast-Stairs starter 4 and 10 step models come with height adjustable (every ¼”) steel top hook straps which allow for one extra stair riser. 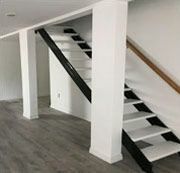 Most building codes allow a 2° slope AND a ¼” variance between any riser heights, thus allowing a combined 2 ½” to 3″ additional adjustment up or down on full size stairs. Using the included extra riser top hook straps does not change the horizontal run. Thus the two sets of achievable height measurements per model, with the same horizontal run, shown on our Models & Prices Catalog page See our stair stringer selection. Width: Measure and/or determine the width of your stairs and cut same size step/tread you choose (from 2x’s to the best hardwood and other fine stair finish products you’ll find locally) to screw onto the perforated step supports. All step/tread materials you add to your Fast-Stairs stringers must comply with the materials load capacity. 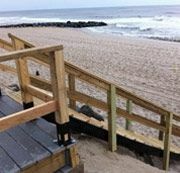 2x12s or 1¼” hardwood treads: up to 48 inches wide. P models: 6 7/8″ riser height, 11″ footstep run, 32° angle, Commercial/public code compliant. A models: 7 7/16″ riser height, 10 1/4″ footstep run, 36.5° angle Residential code compliant. B models: 7 3/4″ riser height, 10″ footstep run, 38° angle Residential code compliant. C models: 8 1/4″ riser height, 7 1/2″ footstep run, 48° angle, Space saver, OSHA compliant. Today, only Claude Ranger Job Supply offers economical direct buying and shipping of engineered steel stair stringers guaranteeing fail-safe fast stair building to continental North American customers everywhere.